DMRD(1987),Mahatma Gandhi Institute of Medical Sciences,Nagpur University,Sevagram, Wardha,Maharashtra. Has been practicing Conventional and Cross Sectional Imaging with special interest in Neuro Imaging, after training from Cleveland Clinic Foundation, Cleveland, Ohio, USA. Faculty in various National Conferences & CME programs of Radiology. Involved in teaching Post Graduate students in Radiology. 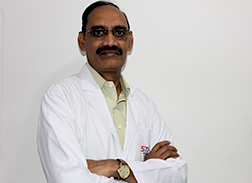 Active member of Indian Radiological & Imaging Association at state & national levels. Conducted state level CME programs & conferences on Radiology.